As part of their new Spring Summer Collection, Laura Mercier have added 14 new shades to their Créme Smooth Lip Colour range, and eight shades to the Caviar Stick Eye Colours. 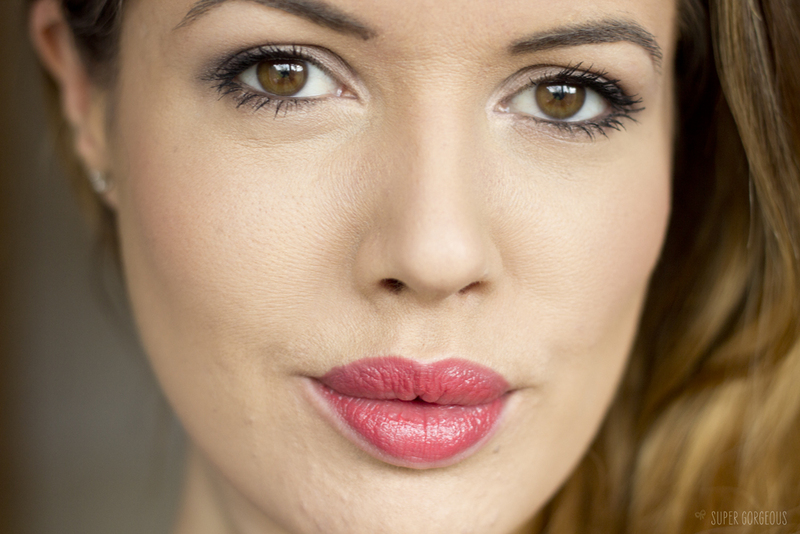 I tested out the new lipstick in Strawberry Sorbet, and Caviar Stick in Grey Pearl. The casing of the Créme Smooth Lip Colors is gorgeous - it feels really sleek and solid, and the lid closes with a satisfying clunk. 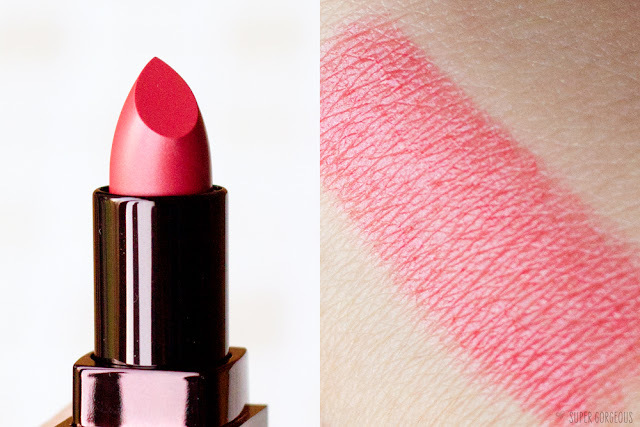 The colour of the lipstick in the bullet is a rather tomatoey red, although it looks different once it's applied - a warm-toned sheer red with a hint of pink. It feels very moisturising and leaves a semi-lustrous finish - almost like a very highly pigmented balm, just not quite so slippery. It contains Olive Oil and Vitamin E, so it really is doing good to your lips while you wear it. Camp Laura Mercier claim that these will last for 6-8 hours, which this one didn't on me - it came off once lunch happened. 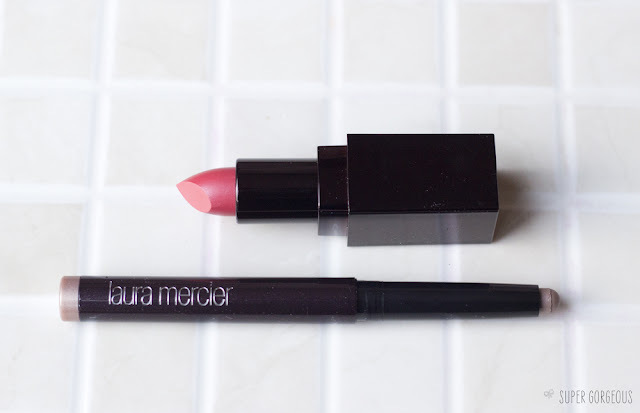 The Caviar Eye Sticks are one of my favourite Laura Mercier products - they are so easy to work with, easily blendable (even with your finger), and super long lasting. Grey Pearl, I thought from the bullet, would be a light taupe colour, but again, once it's applied, it looks a different colour and is definitely grey (with maybe a hint of taupe). It has a subtle shimmer to it which adds a lovely dimension to the eye. It can be worn alone or acts as a great base for other eyeshadows, or to lay the foundations for a smokey eye. I swatched this on my hand this morning, and now, a whole day after with numerous hand-washes, it's still there! I'm really pleased with both of the items I tried. I normally shy-away from grey and silver toned shadows, instead opting for the golden alternative, but I think this is really pretty. 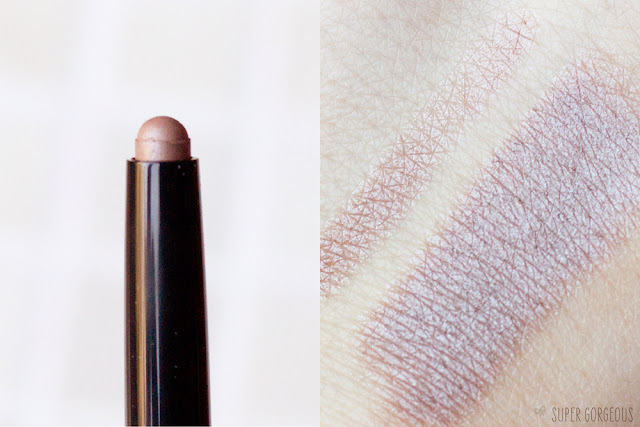 The Caviar Stick Eye Colour in Grey Pearl can be used lightly for a sheer wash of colour, or heavily for more colour impact. After 7 hours on my oily lids it has started to crease slightly, but this is a far better result than any of the usual eye products I use. The lipstick feels so comfortable to wear and is a great way to ease yourself into wearing bold colours because of the finish. The moisturising properties mean it's a fab, and much more colourful alternative to lip balm. I'd never normally apply a red lipstick without a lip brush, but this glided onto the lips so smoothly - it was a dream to apply, and no lip brush was needed! Do you like the look of these products? I really want to check out the Illuminating Eye Colours which are also part of the new Spring Summer Collection - they come in three golden earthy tones but are limited edition - I must get to a counter soon to give them a go. Luckily the new Créme Smooth Lip Colours and Caviar Stick Eye Colours are all now part of the permanent line. Laura Mercier is available at Harrods, Selfridges and Space NK - let me know if you get anything from the new collection! Those colours look surprisingly good together, so pretty! These look beautiful. I really need to try some Laura Mercier products! Been on my 'to try list' for so long but I just havent picked anything up yet!